Low Carb Egg Muffin make the perfect breakfast for on the go. They’re packed with protein and so convenient for busy mornings. Whisk them together in a large 4-cup measuring cup or a mixing bowl. Add any other seasonings you like. Chop up your favorite combo of veggies and proteins and mix until combined. 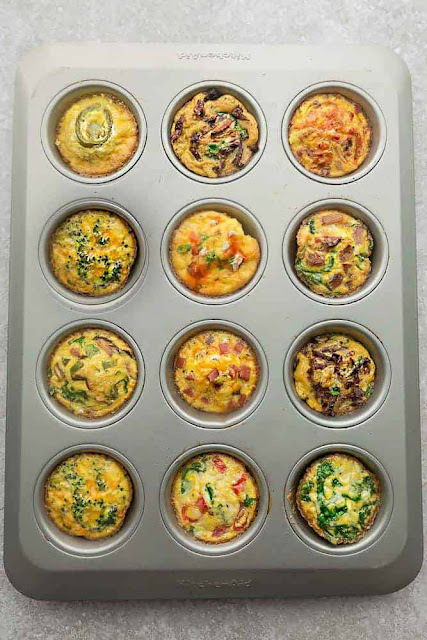 Egg Muffin Cups are the perfect easy make-ahead breakfast for on the go. Best of all, they are packed with protein and so convenient for busy mornings, weekend or holiday brunch! Preheat oven to 400 F. Line a 12 count muffin pan with silicone liners or coat with non-stick cooking spray. Set aside. In a large 4 cup measuring cup or mixing bowl, crack in eggs and whisk together with salt and black pepper. Whisk in garlic powder and thyme until combined. Stir in broccoli and cheddar. Divide evenly into muffin tins1 filling each about 2/3 full. Sprinkle with more cheddar if desired. Bake in preheated oven for 12-15 minutes, or until set. Whisk in garlic powder and buffalo sauce until combined. Stir in green onions. Divide evenly into muffin cups filling each about 2/3 full. Use a spoon to evenly distribute chicken into muffin cups (about 2-3 tablespoons each). Bake in preheated oven for 12-15 minutes, or until set. Serve with a drizzle of buffalo sauce if desired. Whisk in garlic powder and onion powder until combined. Stir in ham and cheddar cheese. Divide evenly into muffin cups filling each about 2/3 full. Top with more ham and cheese if desired. Bake in preheated oven for 12-15 minutes, or until set. Whisk in sesame oil until combined. Stir in kimchi, cheese and bacon (if using). Divide evenly into muffin cups filling each about 2/3 full. Top with more chopped kimchi & bacon if desired. Bake in preheated oven for 12-15 minutes, or until set. Whisk in garlic powder, onion powder and cream cheese until combined. Stir in cheddar cheese, chopped jalapeño and bacon. Divide evenly into muffin cups filling each about 2/3 full. Place 1 round jalapeño slice on top in each muffin cup, if desired. Bake in preheated oven for 12-15 minutes, or until set. Whisk in Italian seasoning until combined. Stir in mushrooms, peppers and spinach (Add sausage if using). Divide evenly into muffin cups filling each about 2/3 full. Bake in preheated oven for 12-15 minutes, or until set. Whisk in garlic powder and basil until combined. Stir in spinach and cheese. Divide evenly into muffin cups filling each about 2/3 full. Sprinkle with more cheese if desired. Bake in preheated oven for 12-15 minutes, or until set. Stir in sun-dried tomatoes, spinach, basil and cheese. Divide evenly into muffin cups filling each about 2/3 full. Whisk in garlic powder and Italian seasonings until combined. Stir in tomatoes, spinach and cheese. Divide evenly into muffin cups filling each about 2/3 full. 0 Response to "LOW CARB EGG MUFFINS "